Sheet from an unidentified shunga album. A guest, whose young age is indicated by an unshaven head (tategami), has taken a seat in a brothel. 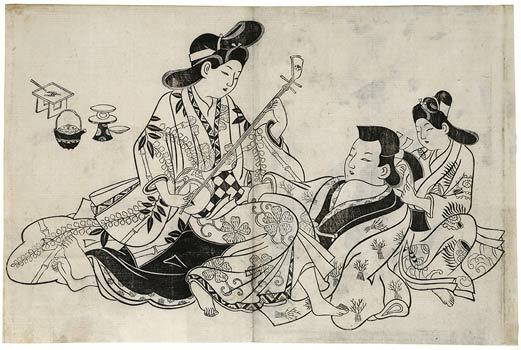 One of the girls, playing a shamisen, is sitting on his lap, while her kamuro (“apprentice”) is massaging his shoulders. The implements for enjoying sake in the background also serve to provide an indication of a certain spatial depth. A scene from a brothel. The guest is lying stretched out on the floor; an oiran playing on the shamisen has seated herself on his lap. Her young kamuro is touching the man’s shoulders with her hands. Their robes are lavishly decorated: wiesteria leaves and bamboo canes adorn the courtesan’s wide jacket, while the lover’s outer robe bears springs of brushwood. The maid’s kimono is decorated with sea animals and waves. A spatial effect in the background is suggested by utensils for eating and drinking. A further impression of this woodblock is known. It is to be found in a private Japanese collection.